Like The Grand Hour EP, this quick burst of crypt punk-pop madness came out in 1993, dripping with spontaneity. 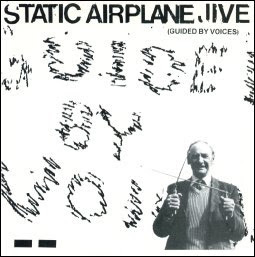 Unlike that EP, however, Static Airplane Jive, is brimming with gems. In fact it may arguably be the best of the '90s grab-bag GBV EP offerings of the time. The EP was later reissued on CD and 7'' in 1997 on Recordhead Records. Big School- 5 Uplifting, somewhat silly, tuneful heavy rock song with colossal choruses. Absurd lyrics are sung with such conviction that you don’t care if you find yourself hollowing “Biiiiiiig Schooool” for no reason at the most inopportune times. Like at funerals and DMV lines, for example. Damn Good, Mr. Jam- 4 Hypnotic guitar picking over deep and dirtied up guitar with Pollard spewing some unremarkable nonsense over it. However, this song does work. Perfect as a lazy Sunday afternoon jam to pop on. Also serves as a comfort track for a hangover. Rubber Man- 2 One from the Suitcase perhaps. Pollard in full on scream with nonsense lyrics, over pounding drums and thin guitar. Not much of a song. Hey Aardvark- 5 Incredibly absurd song both lyrically and musically. Full on British accent as Pollard cops equal parts McCartney and Davies brothers. But it’s extremely catchy and short, and weird. Must listen to many times. Glow Boy Butlers- 4 Heavy, sprawling song that sounds as if it were backed by a novice Keith Moon. Whirling razor thin guitars pound some simple, great riffs as Pollard howls. All hail the empowering crunch. Gelatin, Ice Cream, Plum…- 4 Loud, blaring uptempo song with no real great vocal hooks, and idiotic off-the-cuff lyrics, but still a great flash from the deeply promising song factory of early GBV EPs. listened to this this morning. Love me some "Damn good Mr. Jam"